The Archbishop of York has joined the mother of missing chef Claudia Lawrence to light a candle at the end of a special service to mark the 10 year anniversary of her disappearance. The service was held at St Mary's Priory Church, in Old Malton, where Claudia grew up. The 35 year old has not been seen since 18th March 2009 when she returned home from her job as a chef at York University to her home in Heworth in York. She never turned up for her early shift the next day and a massive police investigation has failed to discover what happened to her. 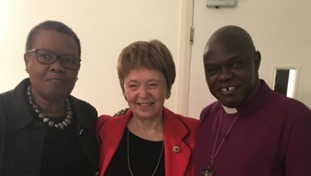 Claudia's mother Joan, who has campaigned relentlessly to find her daughter, said the Archbishop has been a great to support over the years and she was grateful that he had been able to hold the special ceremony. The service was also attended by domestic abuse campaigner Claire Throssell, from South Yorkshire, who has become friends with Mrs Lawrence after her two young sons Jack and Paul were killed by their father in a fire in 2014. The congregation was told how both women had bonded over their tragic circumstances and how their local communities of Malton and Ms Throssell's home of Penistone had helped them through difficult times. There was also a solo performance of Amazing Grace by a student from the Kirkham Henry Performing Arts Centre, a reading by BBC Radio York presenter Elly Fiorentini and a hearing of Claudia's favourite track by the artist James Galway. The Archbishop said: "This gathering, in which the community has come together and care for each other, is an expression of God's love for each of his children. "Most of us cannot imagine the pain of not knowing what has happened to a loved one after this length of time. But the spark of God's love that is in each of us prompts us to support and comfort those who are distressed or in need. "And in that coming together we show and we experience the warmth and light of God's love shining in the darkness." Mrs Lawrence said: "The community of Malton has done so much to support me and my family. I would like to thank everyone for their support and incredible kindness over the last decade and it meant so much to have the Archbishop conduct this special service for Claudia tonight. "Not a day goes by without us wondering what has happened to our loved ones yet we are ever hopeful that we will hear something to help bring healing."